Mike Duncan is an American podcaster and New York Times best selling author known for his award-winning podcast The History of Rome, Revolutions, and the book The Storm before the Storm. The History of Rome aired between 2007 and 2012 and covered Roman history from its legendary founding to the fall of the Western Roman Empire. The History of Rome won best educational podcast at the 2010 podcast awards, and was listed among the best podcasts of 2015 by Apple. "The Storm Before the Storm" entered the New York Times Bestseller list Hardcover Non-Fiction at the eighth place in November 2017. Duncan was born in Redmond, Washington and attended Western Washington University, attaining a degree in Political Science with a minor in Philosophy. He is an avid fan of the Seattle Mariners baseball team. 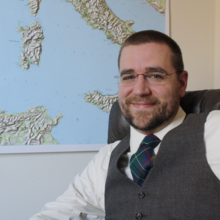 Aside from podcasting, Duncan is currently a stay-at-home dad, and has worked as a fishmonger for most of the time he was doing History of Rome. Duncan also occasionally creates political comic strips in collaboration with illustrator Jason Novak. In 2018 Duncan relocated to Paris, France in order to do research for an upcoming book on the Marquis de Lafayette. During the course of The History of Rome, Duncan married his wife Brandi and made a special The History of Rome episode on Roman wedding customs in celebration. Mike and Brandi currently live in Paris, France, with their son, daughter, and two pets. Brandi is a dedicated runner and has competed in the Austin Marathon. Duncan’s interest in Roman history grew from a “general interest in ancient civilizations”. As a child, he would often flip through his parents’ encyclopedia set to the entries on Ancient Egypt or Ancient Greece, the Maya, the Inca, etc. The largest and most encompassing of those civilizations to Duncan was always the Romans. Mike became especially interested in Roman history while reading his grandfather's paperback version of Edward Gibbon's The History of the Decline and Fall of the Roman Empire. Describing himself as “a complete history geek”, Duncan also has a huge interest in American history. He believes the greatest difference between America and Rome is that compared to Rome, America has only spent a short time on the world stage. Despite studying political science in college, Duncan spent much of his free time studying ancient Greek and Latin texts. "I sort of stumbled into it, so I was reading a ton of Livy at the time, and a ton of Suetonius, and then I had just gotten into Tacitus." Mike Duncan began The History of Rome in 2007, after failing to find any good podcasts about ancient history. The project turned into an award-winning weekly podcast which aired for 179 episodes until 2012 and was downloaded more than 100 million times. The podcast covers the time period from the origin of the Roman Kingdom to the fall of the Western Roman Empire, focusing on the most accepted chain of events according to historical consensus. In the 2010 Podcast Awards, The History of Rome won best educational podcast. Revolutions has aired since September 2013. The podcast covers modern political revolutions, beginning with the English Revolution. Each series follow a mostly chronological approach with one or two episodes at the beginning dedicated to the pre-history of the revolution and its causes, sometimes highlighting when and how the revolution could have been avoided. So far, the series has covered the English Civil War, the American Revolution, the French Revolution, the Haitian Revolution, Simon Bolivar and Gran Colombia, the July Revolution, the Revolutions of 1848, the Paris Commune and the Mexican Revolution. He also includes "supplementals" - special episodes not counted in the normal number of episodes and of more varying length compared to roughly half-hour normal episodes - which deal with a particular topic or person in depth and are sometimes verbatim reproductions of historical texts such as the American Declaration of Independence or the French Declaration of the Rights of Man and the Citizen. Duncan published The History of Rome: The Republic, a collection of edited transcripts from the first 46 episodes of the podcast, opening with the founding of the Roman Kingdom and ending with the breakdown of the Roman Republic. The book received widespread praise, with many reviewers noting how the events described in the book portend to modern times. Benjamin Wittes of Lawfare Blog wrote "Never has a book about history that's two millennia old been so timely...You'll learn as much about the problems we face today from this book as from any newspaper", and a review in the Huffington Post praised his "congenial style", claiming that he "zeros in on Rome’s polarization between “optimates” (conservatives) and “populares” (populists), the disintegration of participatory democracy, and the concomitant rise in inequality, uncivil discourse, and violence. The parallels with modern times, and particularly contemporary America, leap off the page". In episode 7.32 of Revolutions (March 2018), Duncan announced that he was writing a book about Marquis de Lafayette, tentatively titled Citizen Lafayette. Duncan appears as a panel historian on seasons two and three of the Netflix documentary Roman Empire. Benjamin Wittes directly modelled the introduction to the Lawfare Podcast on The History of Rome. Robin Pierson's podcast The History of Byzantium was explicitly modelled after The History of Rome in style, length and quality and was intended by Pierson to act as a sort of sequel to it. Similarly, Peter Adamson mentioned Duncan as one of the reasons he started his History of Philosophy Without Any Gaps podcast. ^ a b "Hardcover Nonfiction Books - Best Sellers - November 12, 2017 - The New York Times". The New York Times. ISSN 0362-4331. Retrieved 2019-01-22. ^ "About The History of Rome". ^ "The Jonah Keri Podcast: Mike Duncan". CBSSports.com. Retrieved 2019-01-22. ^ Yglesias, Matthew (2015-11-09). "How Mike Duncan turned a passion for history into a podcasting career". Vox. Retrieved 2019-01-22. ^ "The Morning News: Articles Written By Mike Duncan & Jason Novak". The Morning News. Retrieved 2019-01-22. ^ a b c "Eye on Italy Interview: Episode 55: The History of Rome with Mike Duncan". Eye on Italy. 31 October 2011. Retrieved 22 January 2019. ^ "Elliott William Duncan!". The History of Rome. Retrieved 2019-01-22. ^ "Episode 160 Mike Duncan History of Rome — RunRunLive". Retrieved 2019-01-22. ^ a b "How Mike Duncan turned a passion for history into a podcasting career". Vox. 2015-11-09. Retrieved 2017-04-23. ^ "PodcastSquared Interview". Archived from the original on 2013-10-08. ^ a b "The Storm Before the Storm: An Interview With Historian and Podcast Superstar Mike Duncan". Daily Stoic. 20 October 2017. Retrieved 2019-01-22. ^ "Podcast Awards - Past Winners 2005-2016". www.podcastawards.com. Retrieved 2019-01-22. ^ "1.1- The Kingdoms of Charles Stuart". Revolutions. Retrieved 2019-01-22. ^ "Revolutions Podcast". www.sal.wisc.edu. Retrieved 2019-01-22. ^ Duncan, Mike (2016). The History of Rome: The Republic. Herodotus Press. ISBN 9780692681664. ^ "The Storm Before the Storm: The Beginning of the End of the Roman Republic". Kirkus Reviews. PublicAffairs. 21 August 2017. Retrieved 22 January 2019. ^ Tharoor, Ishaan (30 October 2017). "How the Republic starts to fall". Washington Post. Retrieved 22 January 2019. ^ Sauter, Vanessa (4 November 2017). "The Lawfare Podcast: Populisms Ancient and Modern with Mike Duncan". Lawfare. Retrieved 2019-01-22. ^ "5 HOT BOOKS: A History of Bunk, the Fall of Rome (with Modern Parallels) and More". Huffington Post. 16 November 2017. Retrieved 2019-01-22. ^ "7.32- The Bitter End". Revolutions. Retrieved 2018-10-13. ^ Wittes, Benjamin (24 September 2013). "Revolutions Podcast". Lawfare. Retrieved 2019-01-22. ^ "AMA with the host of The History of Byzantium podcast". WhatPods. Retrieved 2019-01-22. ^ Slaney, Rowan (2017-05-26). "Revolutions, self-help and the election – podcasts of the week". The Guardian. ISSN 0261-3077. Retrieved 2019-01-22. This page was last edited on 6 April 2019, at 01:01 (UTC).